Footage of a US made Night Eagle UAV reportedly crashed in Wadi al-Mardum located 20-30 km eastern Bani Walid appeared on Libyan social media on November 28th. The front part of the drone that contains all the sensors and camera is missing probably destroyed in the crash or removed by its "discoverers". The aircraft has significant cracks on the underside of the fuselage, indicating that the impact on the ground was hard, but not too violent to keep the structure almost intact. The Night Eagle is a US-made UAV based on a modified Boeing Insitu ScanEagle Block E equipped with an infrared camera for night operations. In the past, the Bani Walid area was often targeted by unidentified aircraft. 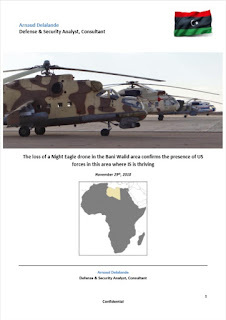 Already, on February 28th, 2016, a convoy of fifteen vehicles was attacked by unidentified aircraft in the Shimikh Valley near Bani Walid, the United States and the LNA denying any involvement in the attacks.